It's the station that first brought Birdsong to the airwaves. 25 years on, it has recently seen an influx of listeners younger than the station. The UK's first official national commercial radio station celebrates 25 years on air this week. Like Marmite, some love it, although it is frequently looked down upon by serious classical music enthusiasts, thanks to its inclusion of classical film score and even video game music and a perception of being bland. However, the station has surprised many by gaining a large number of listeners under 35 in the past year. 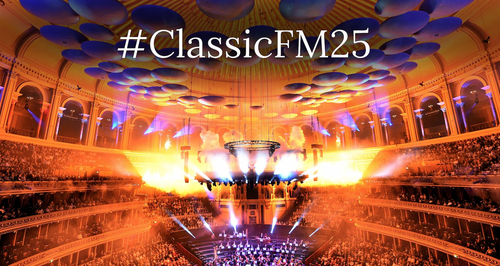 Classic FM will mark its 25th anniversary on air with a special concert on Thursday 7th September from the Royal Liverpool Philharmonic Orchestra. Before the evening concert, special programmes will come from Glasgow, including the station's breakfast show and John Suchet's programme. Launch presenter Nick Bailey is returning to read the breakfast news bulletins. The station has reason to make a big deal of its milestone after seeing large increases in audience figures. According to data published last month, Classic FM had added 418,000 new listeners in the 2nd quarter of 2017 alone – 231,000 of whom are under 35, with 161,000 being younger than the station itself. This under-25 listenership has increased by 30 per cent in the last year. In total, the station now attracts around 5.8 million listeners. Meanwhile, a record 10.3 million unique users visited the Classic FM website between April and June this year. As the station reaches its 25th anniversary, Sam Jackson, Classic FM’s managing editor, speaking earlier in 2017, summed up the station's goal: “Twenty-five years after we switched on Classic FM’s transmitters, our mission remains the same: to make classical music accessible to as broad an audience as possible, no matter what their age, experience or background. When the launch of the station was announced, many people predicted its demise but, a quarter of a century on, one in 10 adults in the UK now listens to Classic FM each week and our digital reach has cemented our position as the world’s biggest classical music brand." Love it or hate it, Classic FM is here to stay. Launched on the 7th September 1992, as product of the 1990 Broadcasting Act, Classic FM became the UK's first official national commercial radio station. Prior to Classic FM's launch, there had only been local commercial - or independent - stations. Any "national" service came from non UK-based or pirate stations. The licence for the new national FM stipulated that the station would not be allowed to be a pop music station. Ahead of Classic FM's launch, tests on the station's FM transmitter network involved the broadcasting the sound of birdsong. Recorded a year earlier in the autumn of 1991, in the Wiltshire garden of Quentin Howard, CTO and launch director of Classic FM, later chairman of DAB multiplex operator Digital One, the soundtrack found a new lease of life in the early years of the new millennium to fill empty capacity on the national DAB multiplex, notably between 2003 and 2005 and after the closure of DAB station Oneword in 2008. Newspaper reports of the time suggested half a million listeners were enjoying the looped rural soundtrack, although Digital One later dismissed those figures.